The PEUGEOT Traveller i-Lab VIP 3.0 Shuttle concept is being unveiled at the forthcoming Geneva Motor Show and presents a vision of the future for innovative and holistic business customer transportation. Connectivity, design and comfort for the driver and passengers alike are at the heart of the PEUGEOT Traveller‘s design philosophy, providing new, distinctive features that set the VIP shuttle apart from the brand's SUV and car model range. Connectivity inside the PEUGEOT Traveller i-Lab provides a unique and streamlined experience. For on-board guests, travelling becomes an inspiring journey, conducive for business, with four individual seats arranged opposite one another around a giant 32" touch-screen tablet. The 32" giant tablet is supported by an arch pivot to seamlessly move the screen within the cabin. Sliding and reclining, it can be used in two ways to get the job done either as an individual tablet, or a tablet split into four screens for just as many users. Developed in partnership with Samsung, the Wi-Fi hotspot, Bluetooth®, charging docks, and virtual reality headset caters for all communication needs to complete the connected journey experience. “The PEUGEOT Traveller i-Lab makes everything so easy and streamlined. The on-board technology is cutting edge transforming everyday life. The arch supporting the touch tablet embodies this versatility by fostering and encouraging exchanges between passengers while on the move.” Alessandro Riga, PEUGEOT Traveller i-Lab Interior Designer. For the driver, the PEUGEOT Traveller i-Lab's technological equipment guarantees the satisfaction of its passengers with journeys made in complete safety with automatic road sign recognition and driver inattention monitoring devices. The PEUGEOT Traveller i-Lab represents the brand’s vision of the future for a VIP shuttle. Through connectivity, uses are multiplied and transform everyday life. 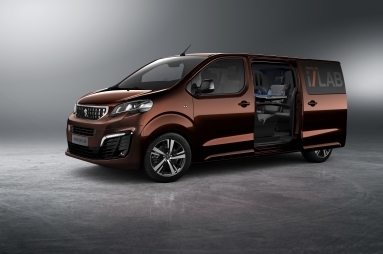 The first step towards this future has been taken with the launch of the new generation of connected 3D navigation on the PEUGEOT Traveller i-Lab. The new generation of PEUGEOT connected 3D navigation informs the driver in real time and in a contextualised way to optimise journeys according to traffic conditions and the passenger's agenda. 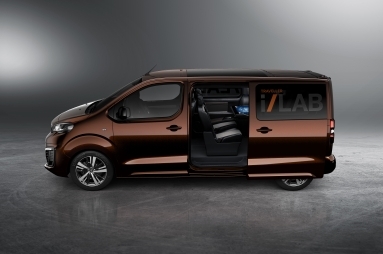 The PEUGEOT Traveller i-Lab is a VIP shuttle study that promotes a hyper-connected journey. As its name suggests, its standard features and high levels of safety deliver stress-free journeys while increasing the passenger’s opportunity to conduct business efficiencies while on the move. From the very first glance, the PEUGEOT Traveller i-Lab asserts its VIP shuttle personality, while indicating it belongs to the PEUGEOT passenger car range. Displayed in its dark copper colour, the expressive front end has the brand's new stylish identity with an elevated new vertical grille that integrates the iconic lion emblem at its centre. The vehicle's design and posture evokes the open spaces combined with luxury comfort. The exterior dimensions make it perfectly suitable for urban environments and its sub 2-metre height allows easy access to underground and city car parks. The hands-free sliding side doors are activated by a simple swipe gesture of the foot underneath the vehicle, allowing the doors to unlock and open automatically for complete ease of access. The environment provided on board the PEUGEOT Traveller i-Lab is conducive to doing business. Isolated from the outside by dark tinted windows, passengers are provided with a comfortable area with individual seats upholstered in Alcantara® and patinated black leather trim, and leather-trimmed inner door panels. The elegantly designed roof console provides a dim light emitted by LEDs and the air supply is delicately balanced courtesy of the climate control system. The PEUGEOT Traveller i-Lab concept study is an extremely high mobility cloud access platform, providing up-to-date connectivity for passengers with the help of partner Samsung. The shuttle pairs all devices to connected services to completely transform the everyday operation of those within. Previously, shuttle journeys were compromised for people with busy schedules, now, the same journey provides an efficient use of time and opportunity. Journeys are optimised in particular due to the new generation of PEUGEOT connected navigation. This displays 3D mapping and suggests alternative routes in real time based on traffic conditions and provides information like weather conditions and fuel prices, thus optimising the vehicle's use. The PEUGEOT Traveller i-Lab boasts an audio installation developed by FOCAL, following on from work carried out on recent concept cars. This installation comprises 17 FOCAL loudspeakers, woofers, mediums, subwoofer and tweeters carefully positioned in the vehicle for an optimum audio experience. The control of these elements by Digital Signal processor adapts the sound to the architecture of the passenger compartment, providing the best level of acoustic comfort in the segment. For the driver, the PEUGEOT Traveller i-Lab constitutes a latest generation business environment offering exclusivity and high-levels of service. Voice recognition provides additional security by allowing the driver to control navigation, telephone and media functions without taking their eyes off the road. The 7" touch screen in the cabin area act as an interface with the on-board park-assist system, VisioPark 1. 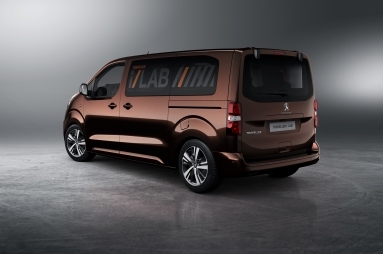 The PEUGEOT Traveller i-Lab monitors the driver's vigilance to prevent collisions. The driver inattention monitoring system alerts them after two hours of continuous driving, then every hour if they haven’t stopped. This equipment also measures the vehicle's dynamic attitude via the camera and steering wheel angle sensor. A visual and audible alert encourages the driver to pay better attention to their standards of driving if it can detect the driver is getting tired or losing concentration. “With the PEUGEOT Traveller i-Lab, the brand confirms its goal of applying its dynamic strategy to all segments. 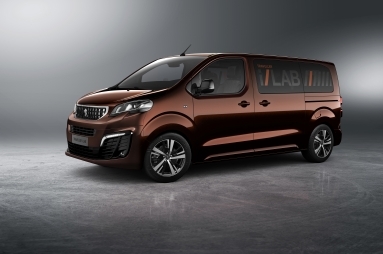 The PEUGEOT Traveller i-Lab has a high level of safety, service and hyper-connectivity to meet the increasing requirements of business customers that want a streamlined and high-quality experience.” JérÃ´me Micheron, PEUGEOT Strategy Director. The PEUGEOT Traveller i-Lab concept will be unveiled alongside versions of the new PEUGEOT Traveller on the PEUGEOT stand on Tuesday 1st March in Hall 6 at the Geneva Motor Show. Since 1810 PEUGEOT has been producing durable products of excellence, since 1858 all are branded with the Lion logo – chosen to demonstrate strength, suppleness and swiftness to personify the durability of its products. As one of the earliest automotive producers, the PEUGEOT brand can trace its roots back to 1889 when it began producing automobiles and since then over 65 million vehicles have been produced, advancing technology with style and efficiency to enhance the customer experience. Demonstrated through its Brand signature ‘Motion & Emotion’, PEUGEOT is present in 160 countries, has 10,000 franchised Dealerships and is recognised the world over for the quality and design excellence of its products. The UK is the third largest market for PEUGEOT with its UK Headquarters located in Coventry. The UK car line-up includes the 108, 208, 308, 508, 2008, 3008 and 5008 supplemented by people- carriers – Partner Tepee and Traveller, and a four-model van range that includes the Bipper, Partner, Expert and Boxer. The 208 is the best-selling PEUGEOT.